Figures of Faith™ are artistic renderings of key moments and people from Biblical times enhanced with scripture and prayer. This sculpture of The Good Shepherd is carefully detailed reflecting superior quality demonstrated by only the finest artisans. 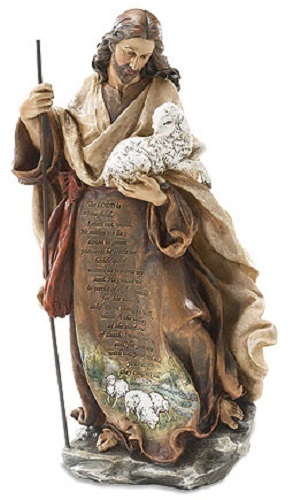 A portion of the " 23rd Psalm" inscribed on the image adds to the meaning of this gift. Full Inscription: "He guides me in paths of righteousness for his name's sake. Even though I walk through the valley of the shadow of death, I will fear no evil, for you are with me; your rod and your staff, they comfort me." Gift Boxed.